This is a non-lethal electrified fence product which attaches to a new or existing fence to protect the perimeter against intrusion. Popular on sites concerned with a very high level of security such as prisons, ports, power generation plants and military bases. Read more about the Electro-Fence™ system. A security product for both indoor and oudoor perimeter protection. The special sensor cable and analyser, developed in-house by the company, are the key components of the system which comes in a variety of options depending upon the application. For indoor use, the cable can be attached to the walls, doors and roof. For outdoor sites, the cable is attached to a new or existing metal fence. Many sites currently use this type of perimeter detection from warehouses and diy stores to construction sites and wildlife parks; even national monuments. 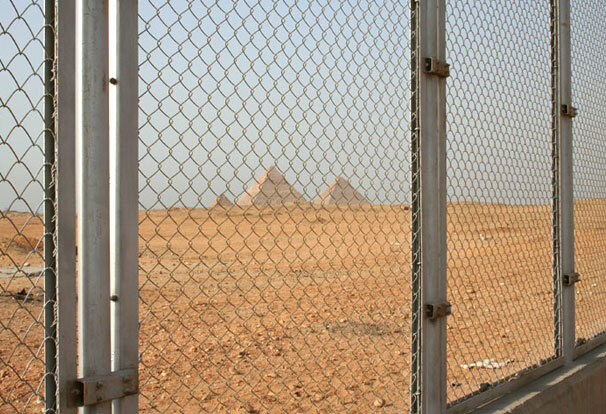 This system was selected as the perimeter alarm system for the Great Pyramids of Giza (photo left taken on site). The company offers a highly credible range of security technology, some with British Government approvals. Added to the two main perimeter security systems outlined above, they also offer a microwave detection system and cctv management control system. The company can design an build bespoke packages for companies which seek a high grade integrated security system. Research and Development projects are also undertaken. When we were awarded the opportunity to provide their Internet marketing service we embraced it as an exciting challenge. The international security market is extremely competitive but the rewards can be great. The company’s global visibility and how that has been rewarded is reflected in their own words when they described our services: “It is without doubt their expertise and hard work that has had a very profound effect on our ever increasing sales. An internationally respected British manufacturer, you can read more about them on LinkedIn.